Todd, a campground host, chats with Jessica, also a host, at her site in the homeless camp on the west side of Durango in November, 2017. In the first week of September, the U.S. 9th Circuit Court of Appeals ruled in an Idaho case that prosecuting homeless people for sleeping on public property when they have no access to shelter is unconstitutional. 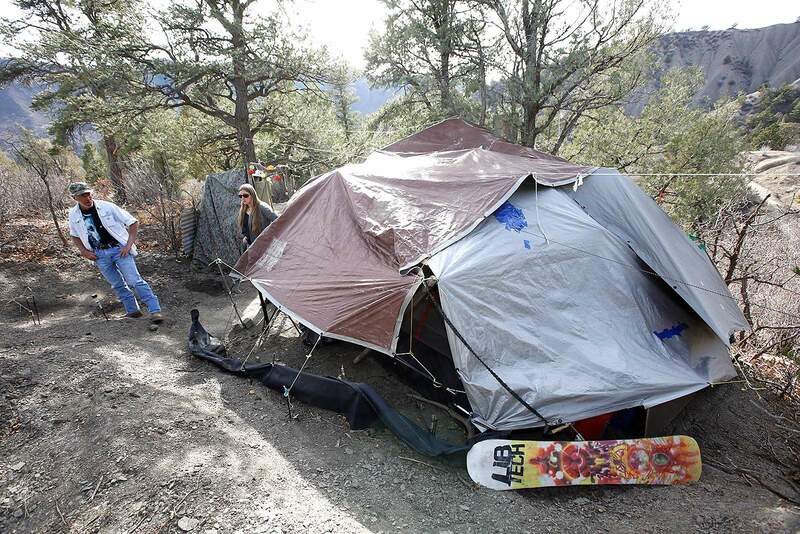 Later in the month, Durango stopped issuing citations to people who camp overnight in public open spaces – parks and sidewalks excepted. In the first week of October, the city dismissed charges against homeless people cited with trespass when they refused to take down their tents after daybreak at the aforementioned camp. Anyone tempted to think that Durango’s homeless residents, with support from the American Civil Liberties Union, are on some kind of winning streak should think again. The second week of October brought snow to the high country, and rain and freezing temperatures to town. Gaining the right to sleep out in that isn’t much of a prize. Of course, to speak of “winning” and “losing” in terms of the homeless issue is pointless. But so is the stark polarization in the discussions our community is having about it. Have zero tolerance for the homeless in town and enforce all laws that exist, is the angry cry from some of our fellow citizens. Pay no heed to court rulings from federal districts that don’t include Colorado and face down the ACLU because providing the homeless with shelter and services will only encourage others to come here and share the free ride. Those in favor of helping the homeless counter: It is now, as it has always been, our moral obligation to help the poor and homeless. We can look to other communities for ideas and strategies that are working and apply those lessons here. Our City Council seems tired of the issue and torn between these two poles. We share their frustration and can provide no magic answers, but we know that inaction and indifference are not viable options. Because it has been proven that it costs more in the long run to arrest and prosecute the homeless than to provide access to basic shelter and some services. Because we have learned that the majority of homeless people do not wander in from elsewhere but are members of the community who have encountered hard times or are fleeing domestic violence. Because in city after city, providing safe, functional shelter – a model known as “housing first” – has proven to be the key step in helping homeless residents turn their lives around (see our centerpiece column by Don Burnes on page 1D). And finally, because the decision to act or ignore may soon be out of our hands: The Right to Rest Act – also known as “the homeless bill of rights” – seeks to establish a set of rights for homeless people in Colorado. It has failed at the committee level of the state Legislature for three years in a row, but it is not going away. Before it was closed due to fire danger, the homeless camp near the Tech Center was working. It had portable toilets and a trash dumpster. And residents had good communication with authorities and were working together to clean up after themselves. It was the wrong location, but not the wrong idea. Much debate remains before we find a long-term solution to this issue. But with winter approaching, now is not the time to abandon all efforts to help.